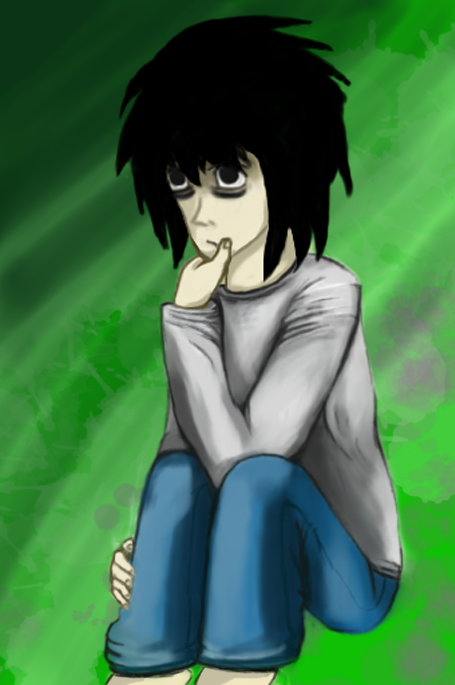 today's drawing inspiration comes from Death Note, an anime I had recently finished. It was pretty good; I know it's one of the staple shows out there that everyone has seen, and I was last to jump on the bandwagon. But if you haven't seen it, it's totally recommended, and on Netflix. This drawing was admittedly done with less care than the others; I was just kind of goofing around. If you know the character (his name is L), you know that I messed up his handed-ness; this happened because I meant to flip it once I was done. Why I didn't just opt to draw it right the first time is beyond me. See below. I went with a stylistic change or two compared to my other drawings; this kind of hits a middleground between my drawings that look like paintings, and the ones that look like cartoons. Success is debatable but it was my first time trying to do that, so I don't feel too bad about it. I'll embed a timelapse video of it's creation below. It's kind of a shame I didn't record a video of my last drawing, which I tried considerably harder on, but they're fun to make either way. The video sped up a lot, and I added a high-bpm song from Dance Dance Revolution, which seemed appropriate considering the "quick and dirty" approach I took. The drawing itself actually came out okay if you think about it that way. You can actually see halfway through it, I decide to make it more cartooney. This happened because while I was drawing it, I kept the original sketch visible as the top layer, so I could reference it. Whenever I did that, it made a really thick outline that I thought improved it. If I was going to outline it so boldly, it was going to have to be cartooney, so I just went with it. I didn't sketch it out beforehand very well; I ordinarily take care with the joints, pose motion and whatnot. I just kind of barfed it onto the page, and you can see I had to keep fixing it in the video. You can see I actually forgot to highlight the hair; it's just one solid black shape. The resulting image was not by best, but was a bit fun to do while I take a break from the last series. Emi should be next on that one.